Little athletes will be the style-setters on the field in the Team Track Pant. Combining the best of Canterbury’s cutting-edge fabric technology and smart athletic style, these track pants boast lightweight, quick-drying polyester in a water-resistant and anti-static finish, so junior team members can stay protected against the elements under any weather condition. The perforated side panels deliver outstanding breathability and comfort, making these pants perfect for training on the field or lounging around the house. With the 12” leg zip and distinctive embroidered Canterbury branding, you’ll enjoy a great fit and immediate solitary with Canterbury’s well-established community of fans and players. 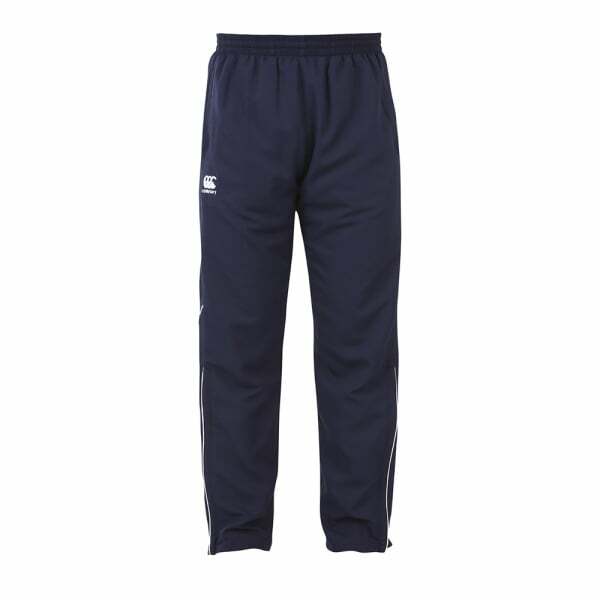 Canterbury’s Team Track Pants are a great on-field and off-field item that are sure to become a staple in your wardrobe. In the Canterbury tradition of using cutting-edge fabric technologies, these trackies feature Vaposhield, a water-resistant, anti-static coating that is quick-drying. You’ll enjoy both breathability and protection from the elements in these stylish and durable pants, which come with perforated side panels for breathability, so you can power up during training while staying protected and comfortable. With the contrast synthetic piping, quality embroidered logo, and 12” leg zip, you’ll look great for workouts and for whatever your day holds after training.